Built in 2015, the Monarch Empress is the newest of four river vessels operated by the Philadelphia-based tour operator Gate 1 Travel, and the first to be built for the company. With the tag line "More of the World for Less," Gate 1 offers affordable vacations for North Americans, Australians and a sprinkling of other English-speaking passengers. The 144-passenger vessel is an elegant ship -- with splashes of colorful contemporary artwork -- and notwithstanding its value-for-money fares, it offers a high level of amenities and very good standards of service from its cheerful and friendly crew members. 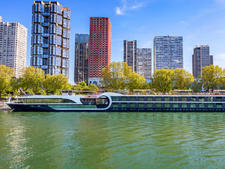 There are 64 good-sized standard cabins and eight suites and although the majority has French balconies, there are no staterooms with walkout balconies. Daily shore excursions are included in the fare and there are optional excursions -- usually four on a weeklong cruise -- that can be purchased in advance for a discount or once passengers are onboard. The lower prices of the cruises are mostly reflected in the food and beverage offerings. More expensive river cruise lines include wine, beer and soda with lunch and dinner and on Monarch Empress there are only complimentary drinks at dinner. Bottled water is provided in the cabin but it is not handed out for shore excursions. Instead of having a full dinner menu of options, the evening meal has a set appetizer, soup and dessert; the only choice for passengers comes with the entrees, where they can pick one of three entrees or an "always available" lighter dish. Additionally, the ship does not offer a speciality dining venue or option of a light lunch buffet in the lounge. That said, Monarch Empress does have some surprising touches of luxury such as sparkling wine with breakfast, which you normally only get with more expensive upscale lines. 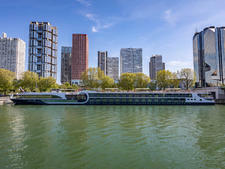 Monarch Empress sails on the Dutch waterways; Rhine, Main and Danube rivers; and offers itineraries, including springtime bulb cruises in the Netherlands and sailings that can be combined with land-based tours. Gate 1 Travel predominantly caters to the North American market, and in recent years also started actively promoting its river cruises in Australia. Therefore, the majority of passengers are Americans, Canadians and Australians. Sometimes folks from other countries find the company's website and book up, so you may occasionally find a few Brits and other English-speaking nationalities onboard. You also might find a noticeably younger crowd aboard. Although many passengers are 55+ and seniors, there were some younger couples too. In addition to couples, there were some small groups of friends plus a few solo travelers, who quickly made new friends as a result of the ship's inclusive and welcoming atmosphere. In keeping with most river cruise lines, Gate 1 Travel does not impose any kind of dress code on its river cruises. The main thing to remember is that temperatures in Europe can be very changeable -- even in summer months -- so pack clothes that can be layered, an all-weather jacket, portable umbrella, sunglasses and hats/baseball caps. Comfortable walking shoes are an absolute must. Some religious sites may require modest dress to enter (no shorts, short skirts or skimpy, sleeveless tops). The onboard vibe during the daytime is very relaxed and casual. Most people change for dinner and wear something a little smarter, but jeans and casual tops are perfectly acceptable. At the final night captain's gala dinner, most men wore collared shirts -- some with jackets and ties -- with dresses, skirts, pants and elegant tops for the ladies. Fares cover red and white wine, beer and soda with dinner. Aside from water, which is freely available at every meal, any drinks ordered during lunch are at extra cost. That said, there is complimentary sparkling wine at breakfast -- a nice luxury touch for anyone who wants to make a mimosa. There are free 24-hour self-service tea and coffee stations in the main lounge and smaller lounge. 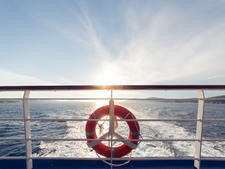 Cruises begin and end with a complimentary cocktail and canapes. Glasses, rather than bottles, of water are available throughout the day in the main lounge. There is an included early morning stretching class that is held either in the lounge or on the sun deck, and any onboard demonstrations and activities do not carry an extra charge. All escorted excursions use audio headsets that are provided in every cabin. The onboard currency is the euro. Gratuities are not included in the fare and the recommended amount is the equivalent of $14 per person, per day, which is shared between all crew members. The tips for the crew can be paid in cash in the local currency and dropped in the designated box on the reception desk, or added to the onboard account. Additionally, the suggested gratuity for the cruise director and activity director is $4 and $2 per passenger, per day, respectively. Note: Gratuities for the cruise director and activity director may not be charged to the onboard account and should be paid in cash and deposited in the box at the end of the cruise or handed to them personally. Passengers can also tip individual members of the crew direct for outstanding service. For shore excursions, the recommended gratuity for local guides is $3 per person, per half-day, and $2 per passenger, per half-day for drivers. Monarch Empress operates a cashless system, and all onboard expenditures, such as in the bar and shop, are added to the ship's account. Closing invoices are presented to passengers for settlement on the penultimate day and payment can be made by cash in euros or by credit card (Visa, MasterCard or American Express). Traveler's checks and debit cards are not accepted. It should be noted that optional excursions booked on the ship are processed through a separate payment system, payable by credit card. The cost of the tours is shown in U.S. dollars, rather than euros, and will be administered through Gate 1 Travel's U.S. office and show up on credit cards as a U.S. transaction.